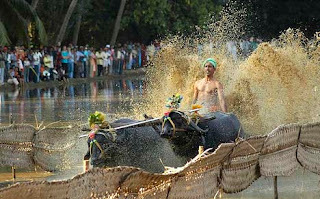 Kambala is basically a traditional buffalo race in muddy waters, is a rural sport, held from December till March. 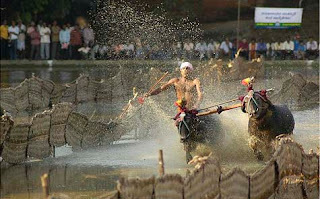 Kambala is traditionally a simple sport. 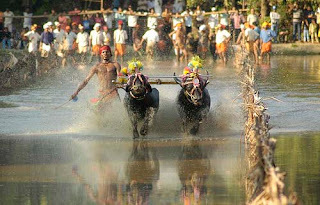 The 'track' used for Kambala is a paddy field filled with slush. The contest generally takes place between two pairs of buffaloes, controlled by a whip-lashing farmer. In olden days, the winning pair of buffaloes were rewarded with coconuts and a bunch of plantains. 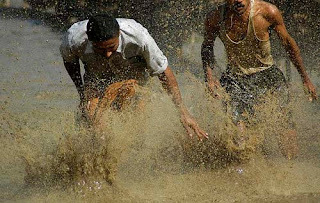 But, Kambala today has become an organised,professional sports. 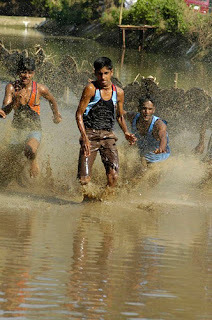 People place massive amounts of bets on the winning buffaloes and one can witness more than 20,000 spectators in a well organised Kambala, egging and cheering the buffaloes to complete the race. 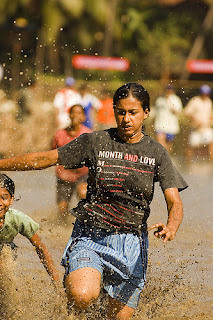 As of now, more than 45 races are held annually in Coastal Karnataka. 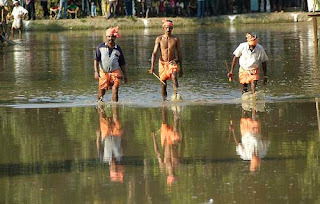 Nearly 18 kambalas are held under the banner of Kambala Samithi and the rest are held under the auspices of temples and political patronage. 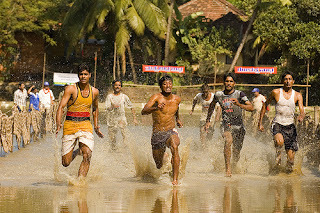 Kambala still remains a hugely popular sport in Mangalore-Coastal Karnataka. 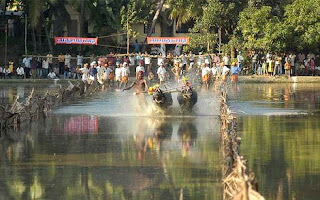 The historically famous Kadri Kambala race is held annually at Kadri Kambalaguthu. 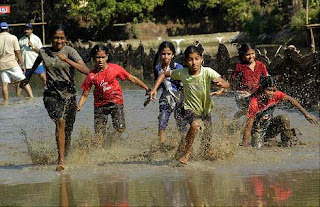 Historians date the roots of this race back to more than a thousand years. 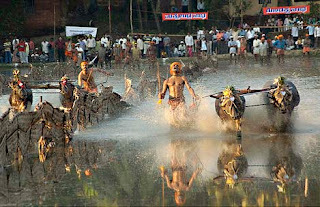 At that time Kambala was the event when farmers paid tribute to their gods for protecting their crops. 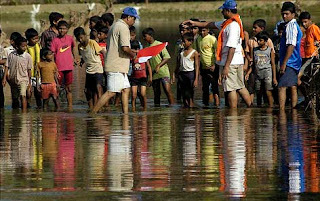 There used to be lot of celebration and games as part of this festive atmosphere. 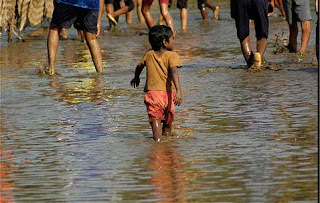 Some say Kambala also marked the beginning of sowing operations for the second round of crops. 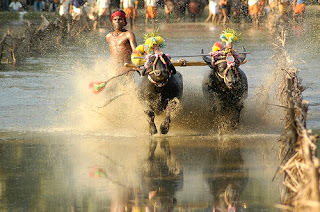 Traditionally, there were two types of kambalas, Pookere Kambala and Bale Kambala. 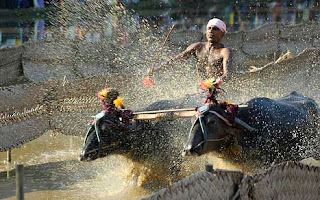 Bale Kambala was discontinued some 900 years ago. 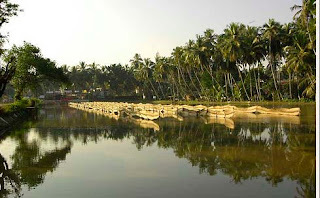 Some of the famous Kambalas include, Mulki Seeme Arasu Kambala (Mulki), Katapadi Beedu Kambala (Katapady), Miyaru Kambala (Miyaru, Karkala), Koti-Chennyya Kambala (Nandikuru, Udupi), Kantabaare-Buudabaare Kambala (Mangalooru), Kolattamajalu Jaya-vijaya Kambala (Bantwal), Soorya-Chandra Kambala (Belthangady), mudur-padur Kambala (Bantwala), Jaya-Vijaya Kambala (Karkala) and koti-chennaya Kambala (Moodabidri). specially prepared for the Kadri Kambala festival in Mangalore. The owners of the bullocks walking back after their turn is over. The jockey rides a wooden structure that is tied to the bulls. 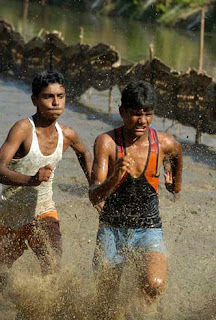 A pair of bullocks make a splash as they race towards the finish line.